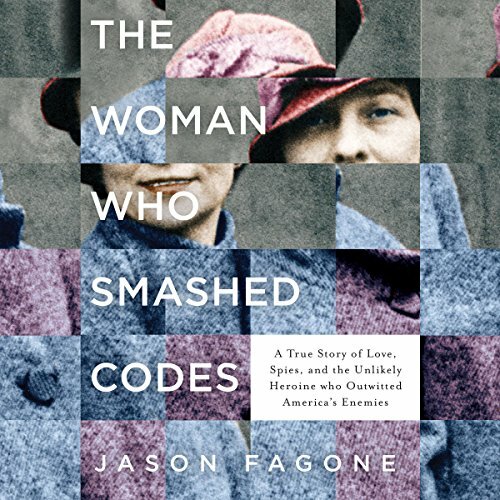 In The Woman Who Smashed Codes, Jason Fagone chronicles the life of this extraordinary woman, who played an integral role in our nation's history for 40 years. After World War I, Smith used her talents to catch gangsters and smugglers during Prohibition, then accepted a covert mission to discover and expose Nazi spy rings that were spreading like wildfire across South America, advancing ever closer to the United States. As World War II raged, Elizabeth fought a highly classified battle of wits against Hitler's Reich, cracking multiple versions of the Enigma machine used by German spies. Meanwhile, inside an army vault in Washington, William worked furiously to break Purple, the Japanese version of Enigma - and eventually succeeded, at a terrible cost to his personal life. Fagone unveils America's code-breaking history through the prism of Smith's life, bringing into focus the unforgettable events and colorful personalities that would help shape modern intelligence. Blending the lively pace and compelling detail that are the hallmarks of Erik Larson's best sellers with the atmosphere and intensity of The Imitation Game, The Woman Who Smashed Codes is riveting popular history at its finest. Stories like this one, of smart women who conquered, are so important for the self image of women, the image of women perceived by men and children, and for the common psyche. A fascinating story impeccably researched. Fagone has done American history a real service with his biography of Elizabeth and the birth of the NSA. Captivating and sublime biography of courageous pioneers, their struggles and the triumph of integrity over wickedness. I hope someone makes a movie out of this book. I learned so many things concerning the war that somehow was skipped over in school. I recently read “Code Girls” by Liza Mundy. This book “The Woman Who Smashed Codes” makes a nice addition or compliment to the storyline. Elizabeth Smith Friedman is the subject of this book. Mundy also mentioned Elizabeth’s husband, William F. Friedman, and deemed them to be an important team of cryptologists. William F. Friedman was famous in World War Two for breaking Purple, the Japanese cipher machine. Elizabeth Smith was a college educated teacher who was recruited by George Fabyan to work in his Riverbank Laboratory in 1910. She was hired to work on secret codes. She went on to play a key role in the development of cryptoanalysis in the USA. She met William Friedman at the Riverbank Labs and soon they were married and working together decoding messages for the government during World War One. Between the wars and during prohibition, Elizabeth broke the codes of the smugglers for the Coast Guard and other divisions of the Department of the Treasury. She frequently testified in court. During World War Two Elizabeth worked on decoding messages from spy rings in the North and South America for the Coast Guard. J. Edgar Hoover asked her to set up the Cryptology Division of the FBI. The book is well written and meticulously researched. At times the book reads more like a spy novel than a biography. Apparently, J. Edgar Hoover took credit for a lot of the work done by Elizabeth. This is another in a series of books about women’s little-known role in science and government work during both wars. I read this as an audiobook downloaded from Audible. The book is thirteen and a half hours long. Cassandra Campbell does an excellent job narrating the book. Campbell is an actress and voice-over artist as well as an award- winning audiobook narrator. Campbell won the 2011 Audie Award. She also was the Best Voice in fiction for 2009 and 2010. She was Best Voice in Children’s literature for 2009. Audible just announced Campbell as a 2017 inductee in the Audible Narrator Hall of Fame. Intriguing title and phenomenal woman! The description said the book might be compared with &quot;Hidden Figures&quot; and &quot;In the Garden of Beasts&quot; or even the &quot;Imitation Game&quot;, but that may be an understatement for what this book does for shedding light on the life and work of Elizabeth Smith Friedman. Her work has gone unnoticed because of her husband's work and hidden under the guise of national security. The pdf that is available with the audible book is helpful. The book kept my interest and still left me wanting to know more. This is a dynamite book! This book might be a good book to recommend for students to read. This book will be on my list of books that I listen to multiple times. Many thanks to the author. This book is a perfect example of how much of history is made up of people toiling away in back offices without fanfare or recognition. In fact, it seems that endless days of tireless hard work and perseverance with pencil and paper really played a major role in winning the war. Elizebeth's story is a fascinating global look at WWII. Engaging and offering an overview of world events from a personal perspective. The companion PDF presents excellent additional insights into the methods of code breaking. Lots of background detail about both Enigma and Purple--the Japanese code machine is offered. A must for both history lovers and anyone who enjoys a good biography. I am so glad this magnificent woman's life and career was brought into the public arena so we all can appreciate her intellect, spirit and sacrifice. Well written and narrated. The story moved along and held my interest. Don't worry if you don't understand some of the explanations of the ciphers, I didn't, and it did not interfere with enjoyment or understanding of the story. Well told, researched and intriguing. A story, that by necessity, shrouded in government classification and, by tradition, dismissed by male prejudice, is finally told of a great mind and personality. Wonderfully narrated as well. Outstanding! It has to be made into a movie. Haven't stopped talking about this book. Amazing story. It'll be a movie for sure. Has some technical elements but it makes it even more interesting. Educational and entertaining. I'll be sending to others to read.